Musings of The Mom Jen: "Wegs and Hayur"
Home > K, Smart Things, Things I Love > "Wegs and Hayur"
K likes pens, and markers, and chalk, and anything that resembles a writing implement. Whenever you have a pen and something to write on, she tells you, "you make happy fassssth." So I make happy faces. Happy face after happy face. Big ones, little ones, silly ones, and sad ones. A hundred of them isn't too many for her. I can sit there for an hour drawing a circle two eyes and a mouth. ...amid the Bakugan, she made a happy face of her own. Complete with "hayur" and "wegs" coming out of the head! My developmentally-appropriate child is a genius! OH! You must be so proud! Those are the cutest wegs, I ever saw!! AND, K, is pretty darn purtty too! That's adorable. I can see a master in the making. See? How can that beautiful lil face let you have PHLD?? I have pictures of my boy with the same drawing!!!!! Too cute - good job, K! My 3 yo can't get enough of sidewalk chalk; she walks around with a pen/crayon/marker in her hand with a lil book and asks to take our order too! I agree, she is a genius! And precious, too! I just love the little steps and the little moments the rain upon us as they grow. Aww... she did a great job! Awww - that's adorable! She has incredible talent. Cute! Carter's drawing is starting to resemble that picture. I love watching the changes in his drawings! love the wegs and hayur!! so cute! Forgiving me for being so bold, but I am giving away a free cartoon caricature drawn by me on my blog. No gimmicks - just my way of celebrating two years of blogging. Please click over and sign up for a chance to win. the teacher in me has to say that k is smart!! that is impressive drawing for a 3 year old! get her enrolled in the advanced classes now! Oh wow!! No seriously, that REALLY is so genius!! My son was almost four before he drew a wegs and hayr! She is a genius! I believe I see cheek bone detail on the right, hmmmm? That is so cute! Love the hayur! It almost looks like a bakugan! Great portrait! She captured your smile perfectly...or am I the only one that recognizes your impish grin? Hello Again! Thank you for becoming a follower on my blog. I am honored. Good luck on my little giveaway. 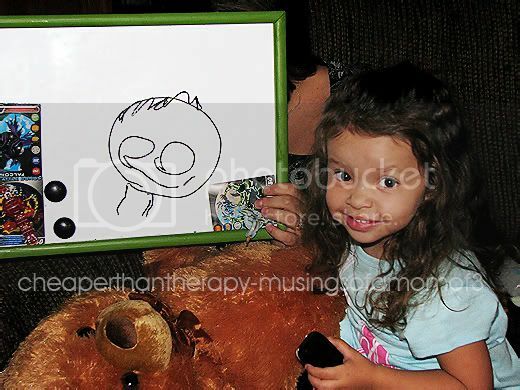 Too cute...the child and the drawing! Yes, it was genius-ly, developmentally appropriate!!! And oh-so-cute!!! She is TOO sweet, Jen! Love the drawing! First off, HOLLA for being listed HIGHER than Dooce!!! WOOT! Second, she is adorable. My kids are still banned from drawing instruments after a wall accident, but maybe I need to rethink things so they don't fall behind. Good job, little lady! My class at the preschool where I work are kids just your age. You did that perfectly! Is it at all appropriate to tell you that my wegs ahve hayur? She's definitely brilliant! And I so need to write down my resolutions! I've been thinking about them, but I want to write them out and maybe share them! TOO cute!!!! love it! I'm so glad you got a picture of her first happy face! :) and if she gets any cuter, I think I'll burst, seriously. and cuter than a bugs ear too! I think this little cutie would work well on the Supermommy team. Happy New Years Jen! K is so cute, I love her Happy Face. I like the Wegs & the Hayer!